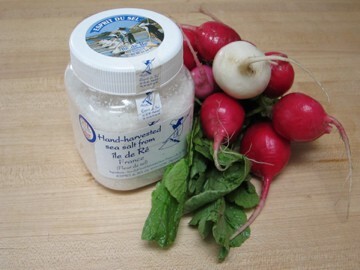 Here is my variation on the classic French theme of radish-sea salt-butter-baguette. 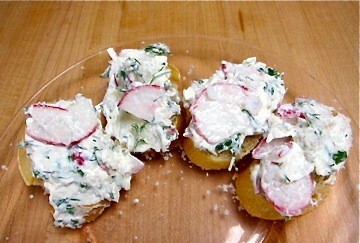 My radish spread with fresh herbs is a great snack to serve with a glass of white wine. There’s just no substitute for fresh herbs and it’s fun to experiment with different combinations. TIP: Be sure to have the cream cheese at room temperature before your prepare the spread. 1. Clean, top and thinly slice the radishes. 2. In a medium-sized bowl, combine radishes with the dill, parsley and chives. 3. In another medium-sized bowl, combine the cream cheese with the lemon zest and juice, salt, pepper and crème fraiche, stirring until thoroughly combined. Using a gentle hand, add the radish-herb mixture. 4. Spread on toasted baguette slices and garnish with more flaked sea salt. Serve immediately. This may be part of supper during our sudden heat wave – yikes! Yum. This is a great idea for a quick appetizer! Love the blog, Liz. Good reminder. What a refreshing thing of goodness. Great reminder of a yummy dish of goodness. How refreshing. Thanks – you are up next week!